Homozygosity for SLC24A5 exon 7 deletion. Homozygosity for the 628 bp deletion of SLC24A5 is not lethal as evidenced by a single blue-eyed horse. The bilateral blue eye color is shown here (right eye is shown in inset). Two genetic mutations identified in Puerto Rican Paso Fino horses in a just-published study could explain 88% of cases with the striking “tiger-eye” coloring. Tiger-eye has not been documented to date in any breed other than the Puerto Rican Paso Fino. The breed is an isolated island population believed to have originated from the importation of Spanish horses, including the now extinct Spanish-Jennets, and are closely related to other breeds of Spanish origin. While the breed is perhaps best-known by horse enthusiasts for its distinct lateral four beat “fino” gait, tiger-eyed horses are especially valued for their striking appearance. Most horses have brown eyes, but in “tiger eye” the horse’s iris color is characterised by shades of orange, yellow, and amber. The favorable trait does not appear to harm vision in any way. Rebecca Bellone and her colleagues said pedigree analysis identified a simple recessive mode of inheritance for the trait. The research team carried out detailed genetic testing on 24 Paso Fino horses which led them to the ECA 1 region, which harbors the candidate gene. Phenotype scale used for iris color variation. Yellow, amber, and bright orange irises were considered to be tiger-eyed. Horses with dark brown/black eyes were considered to be the wild-type phenotype. Blue, light brown, and gray were excluded from the study. They zeroed in on the SLC24A5 gene, which is known to have a role in pigmentation in humans, mice, and zebrafish. For example, humans with mutations in this gene are known to have albinism affecting the eyes and skin. Two mutation in this gene were linked to tiger-eye, which they referred to as Tiger-eye 1 and Tiger-eye 2. Testing of 122 brown-eyed Puerto Rican Paso Fino horses found that none of them were homozygous for either tiger-eye-associated gene variants (that is, none has inherited a copy of the same mutated gene from each of their parents). 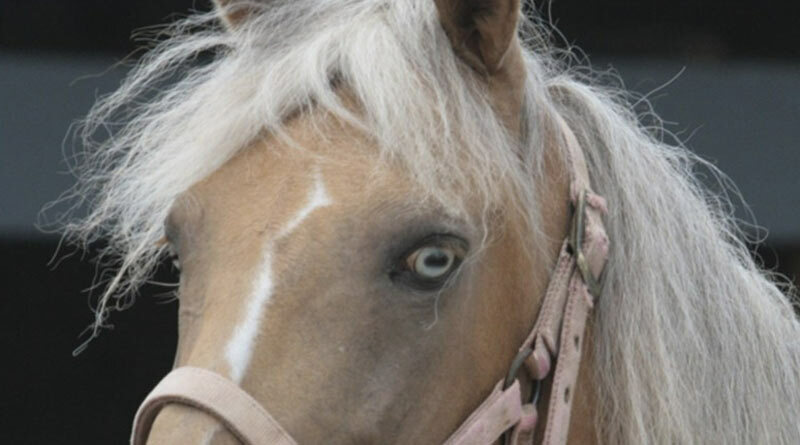 “Here, we propose that two mutations in SLC24A5 affect iris pigmentation in tiger-eye Puerto Rican Paso Fino horses,” the researchers reported in their study, published in the journal G3: Genes | Genomes | Genetics. Bellone her colleagues are the first to unravel the genetics of an iris color variant in horses with no known associated coat dilution or white spotting. Interestingly, in humans, mutations in this gene are associated with multiple effects, but in Paso Finos it appears to affect only eye color – and without weakening pigmentation. A board-certified veterinary ophthalmologist, as part of the study, conducted detailed eye examinations of a small group of Paso Fino horses with and without tiger-eye, finding no ocular abnormalities associated with the mutations. No visual deficits were noted and no signs of reduced pigmentation in the retina or on the retinal pigment epithelium were observed. To strengthen their case, a total of 196 horses from related breeds with conventional eye colouring (90 Colombian Paso horses, 20 Mangalara horses, 44 Lusitano horse, and 42 Andalusian horses) were tested for the Tiger-eye 1 and 2 variants, but neither were found. Discussing their findings, the researchers said the two mutations identified in the SLC24A5 gene explained 88% of the tiger-eye cases in their study. Twenty of the tiger-eye horses were homozygous for the Tiger-eye 1 mutation, while eight were compound heterozygotes for Tiger-eye 1 and Tiger-eye 2 alleles. Of the four horses who could not be explained by these mutations, three phenotyped as Orange-Tiger, a shade on the darker end of the tiger phenotype spectrum. These, the researchers said, may represent a gradation in the phenotype that could not be resolved and may actually be examples of a lighter shade of brown irises. Tiger-eye iris phenotype in the PRPF horse. Tiger-eye is defined as a lighter iris shade characterized by bright orange, amber, or yellow as shown here. The study team said future research investigating the genetics of iris color variation in vertebrates should include SLC24A5 for consideration as a candidate gene based on the novel role identified in this study in horses. Bellone specializes in molecular biology related to animal genetics. She is deeply involved in research into spotted horse genetics, including exploring the link between coat colour and night blindness, and she was recently recognised internationally for research of 25,000-year-old cave paintings of spotted horses on the walls of caves in Pech Merle, France. The full study team comprised Bellone, Maura Mack, Elizabeth Kowalski, Robert Grahn, Dineli Bras and Maria Cecilia Penedo. The researchers are variously affiliated with the University of California, Davis; the University of Tampa; Florida, and Centro de Especialistas Veterinarios in San Juan, Puerto Rico. Maura Mack, Elizabeth Kowalski, Robert Grahn, Dineli Bras, Maria Cecilia T. Penedo, and Rebecca Bellone.